High quality dual playback deck / controller / media player from Denon with dedicated outputs for each layer; meaning you can play a set with just one deck. A ‘retina’ quality touch screen display enables sophisticated multi-touch gestures. The SC5000 is also the world’s first DJ Player capable of on-board music file analysis and accurate beat gridding. Driven by Denon’s ‘Engine Prime eco system, the SC5000 Prime also features eight multifunction trigger pads for expressive hot-cues, loops, slices and roll playback. 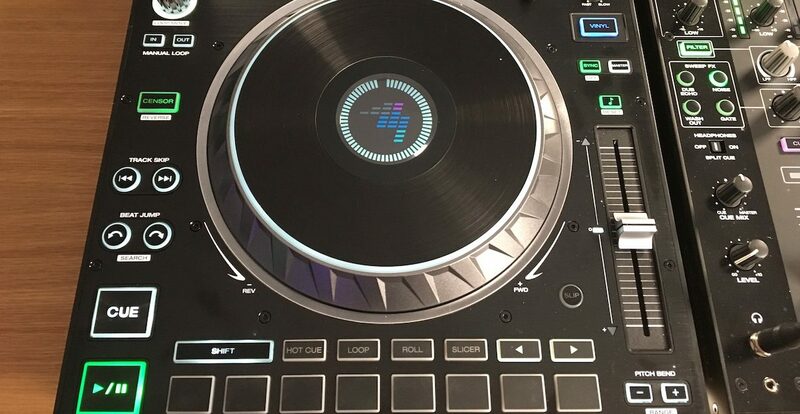 Pioneer DJ has a serious competitor, and DJing is all the better for it. It makes sense to give first impressions of this unit against the Pioneer DJ CDJ-2000NXS, which is the player the SC5000 Prime is gunning for, and which is a comparison that will most clearly demonstrate how Denon DJ has gone about its attempt to usurp the sitting giant in the pro DJ booth. So, we placed the Denon DJ SC5000 Prime alongside the latest Pioneer DJ media player (the CDJ-2000NXS2). Before even plugging it in, the most striking thing initially is the similarity, not the difference, between the units. Frankly, barring the brand name, the non-DJ would be hard pushed to spot anything. They both have a big, raised platter. They both have a decent-sized screen, raised at the back (the Denon DJ’s screen is slightly bigger). They’re both black. 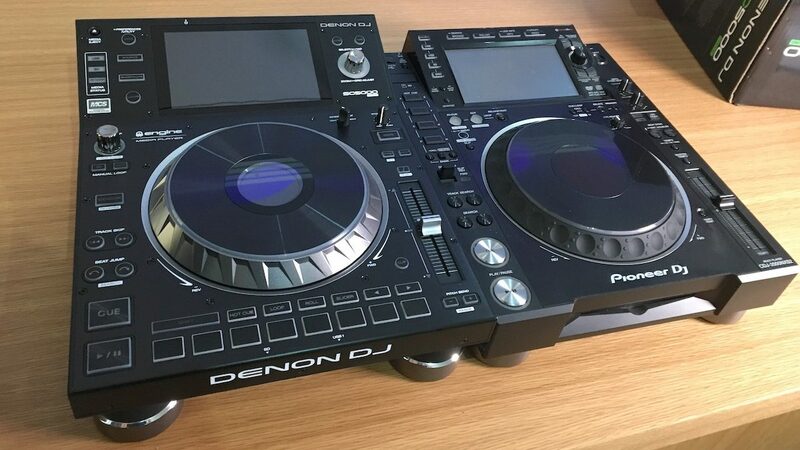 They’re almost exactly the same size (the Denon unit appears wider, but it’s only because the raised section at the back is full-width, whereas the NXS2’s raised section is narrower; the Denon unit is also slightly higher at the back). And they both have those slightly kitsch, oversized silver feet, that in modern media players don’t actually do an awful lot apart from – presumably – nod to a continuity of function between digital players and record decks. Side by side, they’re actually more or less exactly the same size, but the SC5000 appears slightly bigger. Heck, when Denon DJ first gave me a hands on with these units back in December 2016, it took me till the end of the (admittedly bleary eyed, early morning) session to realise that the SC5000 Prime has no CD slot! These are purely digital players, designed to work with computers, software and portable media storage such as USBs and SD cards. If anything, the Denon player appears overall simpler and “cleaner” than the Pioneer; the removal of Pioneer DJ’s all of a sudden convoluted-feeling looping and legacy cue/loop memory sections in favour of simpler controller-type loop functions, plus a cleaner area around the screen (the Denon DJ unit has half the buttons of the CDJ-2000NXS in this area), in conjunction with the moving of the media slots out of sight, mean that even with the new performance buttons, the Denon DJ unit somehow appears a little less intimidating. More on this later – but as you’re going to see, actually the biggest innovations are associated with workflow and usability, not the somewhat cunningly similar layout. Better together: the SC5000 and X1800 add up to more than a sum of their parts. 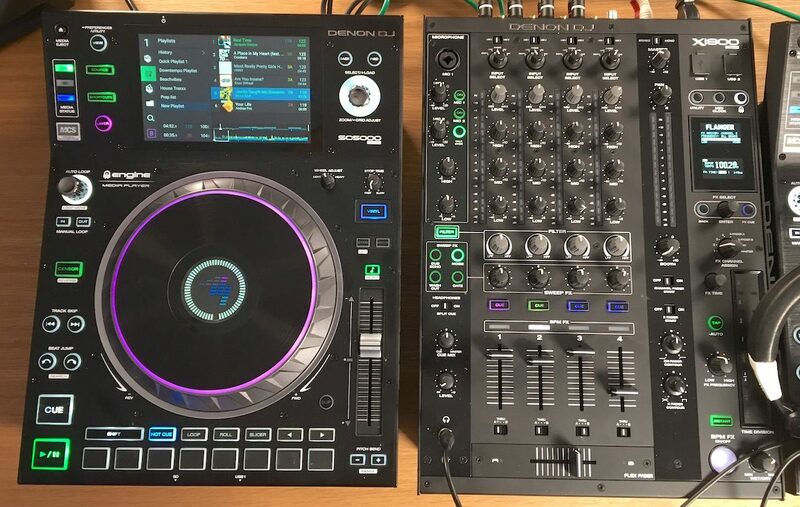 While the SC5000 Prime players work fine with any DJ mixer (that has four channels, of course, assuming you buy a pair), they are designed to work with the X1800 Prime mixer, as we say, the subject of a separate review. Apart from the cue lights on the mixer corresponding with the deck colours on the SC5000 Prime units (nice! ), direct tempo information from SC5000 ensures 100% accuracy of BPM and Sweep FX. 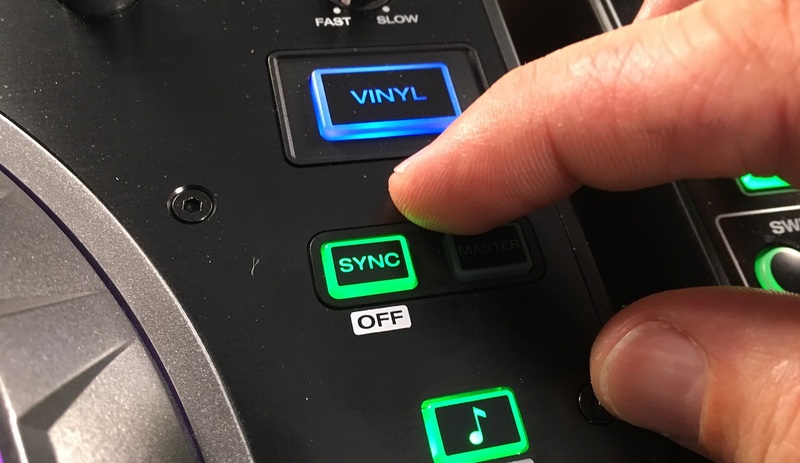 The “On Air” mode illuminates actives decks when channel fader is open, and were you to have more than two SC5000s, the mixer’s built in networking hub negates the need for a separate hub. The contents of the box. One of the items is a USB extension cable, for plugging in hard drives or other items which won’t easily reach one of the on-unit sockets. In the box, as well as the unit itself you’ll find a network cable (used for linking two players together, or the player to a Denon DJ X1800 Prime mixer), a USB cable (and separate extension), two good-quality RCA cables (for linking your player’s two decks to the mixer), a cleaning cloth, an instruction manual, and a power cable. Once plugged in, you connect the RCA outs to your mixer (two spare channels needed to use the player’s two decks) and insert a USB drive or SD card into one of the SC5000 Prime’s media slots. 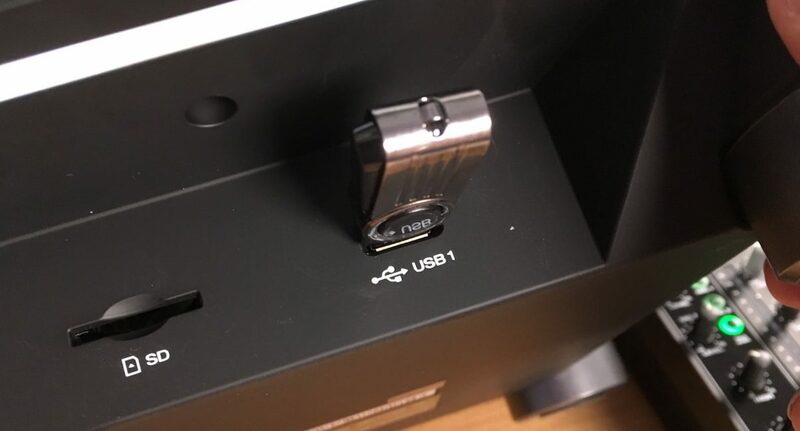 The unit actually has three USBs and one SD slot; one of the USB slots and the SD slot are on the front as mentioned earlier, and there are two additional USB slots on the back. you could plug additional media in the back; have a permanent hard drive of venue music and let DJs bring their own too; or (as we did, gotta be honest) charge your iPhone in the back while DJing from a USB plugged into the front! Smart Loops – Neat one this. When looping manually it ensures the loop snaps to a recognised beat division (eg two, four beats). This works independently of Quantise settings. The Preferences pane, accessed via the touchscreen. Exactly the same Preferences pane can be accessed in the Engine Prime software, to set everything ahead of time fear easy import on arrival at a venue. Note that you can record your preferences back to the USB or SD; that means when you play with that drive on another Denon DJ set-up, you get the option to load them back. Also, when you load that card or drive into a laptop copy of the Engine Prime software, you can do the same (there is an identical panel of settings in that software, too, so you can do all of this ahead of time). So now lets move on to the Utility menu. Screen brightness – Turns down or up the main screen and the small, round screen on the middle of the jogwheel; unfortunately, doesn’t turn down the brightness of the backlit buttons. That ought to happen too: Maybe on its own menu item, Denon DJ? There is also an Update Firmware function, and various pieces of info about the player here. For quickly getting the most important things right – especially on a player that isn’t yours – the Shortcuts button brings up a truncated menu with only the really important stuff. If your USB contains music prepared on Denon DJ’s brand-new Engine Prime software (prepared in the same way you’d prepare music for use on Pioneer DJ media players using Rekordbox), the players works at their optimum. But if your USB contains music files that have not been prepared in this way, the unit will analyse them “on the fly”, taking a few seconds for each, as you load them. That means it’ll work out BPM, key, waveform information and beatgrid, and load all the metadata including album artwork. This makes the SC5000 Prime the first media player ever to act like software in this way, independently of a computer, and it can do it because it has multicore processor (basically, a computer) built in. DJs who don’t go near any kind of DJ software can therefore take advantage of features previously unavailable to them, and this is a major advantage of the SC5000 Prime, representing something of a revolution, because it raises the bar for what any DJ media player should be able to do considerably, and immediately makes its competitors look somewhat inadequate – it’s not their fault, but rather that this is seriously that big a power jump. The USB and SD card slots on the front of the unit, where you’d expect to find a CD slot on a CDJ. Note the fact that they’re well indented, making them safe from prying hands, and being accidentally knocked out. Note that USBs need to be formatted as FAT or exFAT; there is limited or no functionality with devices formatted in alternative ways. It would be great if the unit could have the option to batch analyse everything on a USB inserted into it; that would mean seriously lazy but digital-friendly DJs with a pile of raw tracks on a drive could leave the unit alone with their music for a few minutes before a performance, then be able to DJ as if it had all been pre-analysed on Engine Prime (ie no waiting times on loading for track-by-track analysis, full search and so on). Anyway, to get those first sounds coming out of your player, you’ll probably find yourself selecting the music source by pressing the Source button, using big scroll encoder and back/forward navigation buttons to load a track (just as you would on any media player), and hitting play. Voila! Music. In the next section, “In use”, we’ll take you through all the features and functions of the players when it comes to actually DJing on them. Officially referred to as “music analysis and management software”, Engine Prime’s job is to let you prepare your tracks for playing on the SC5000 ahead of time, before exporting them to a USB or SD to take to your gig. This is exactly the function that Rekordbox software serves for Pioneer’s players, and for you Serato DJ users, it is like Serato DJ’s offline mode. 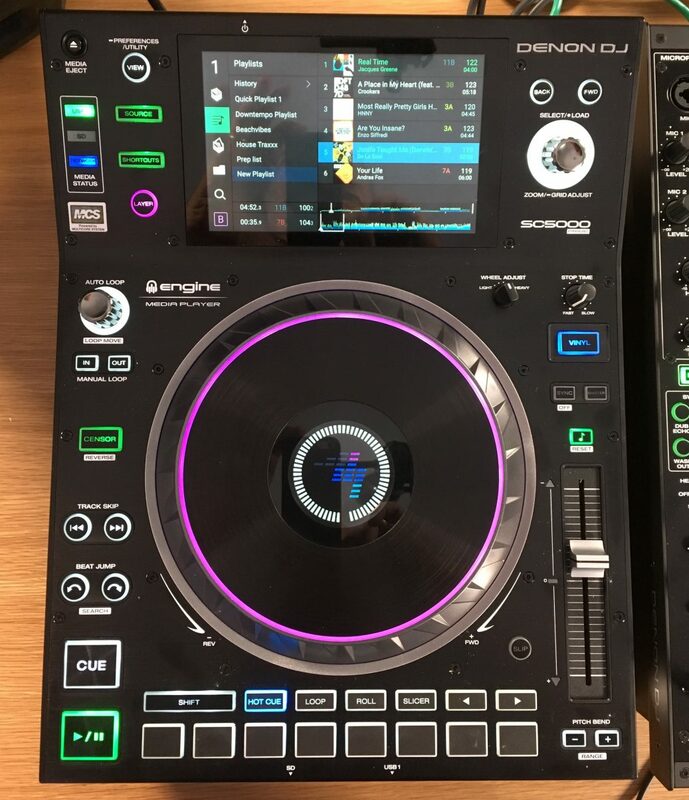 What this isn’t is fully fledged DJ software; you can’t plug this into an SC5000 set-up and DJ straight from your laptop (nor would you want to). 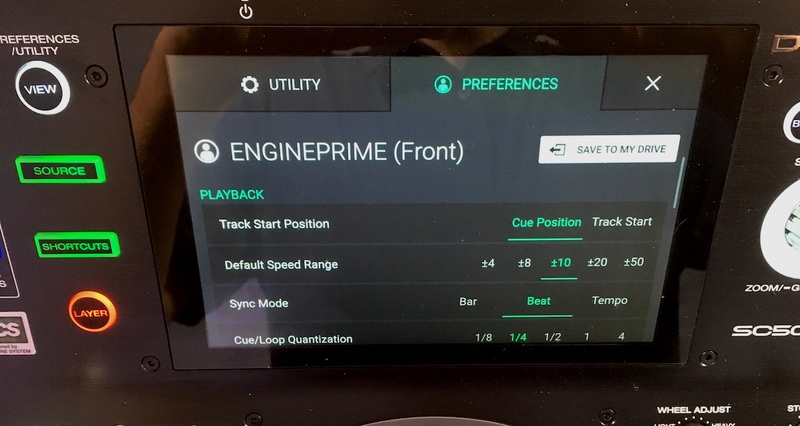 Engine Prime, like the SC5000 players and onboard software, is slick yet simple. in feel. 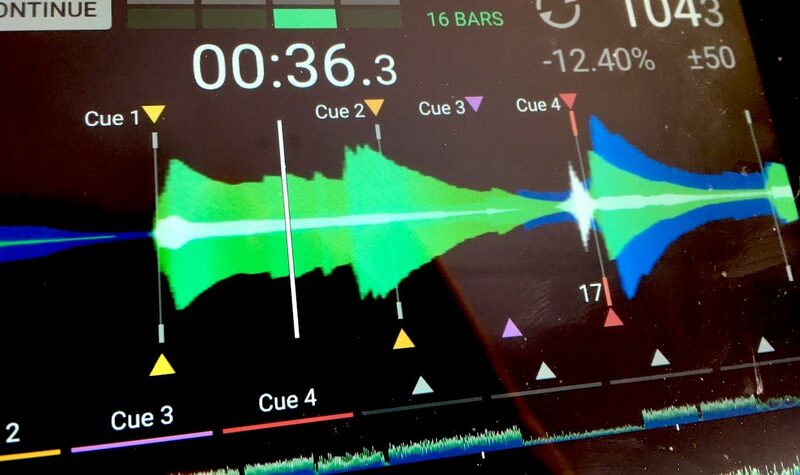 Its abundant use of black and lime green feels like Spotify, and its smooth scrolling waveforms (especially in dual layer mode, so you can sync and play two tracks together to play DJ blends, acapella use, compatible loops etc, complete with vertical onscreen crossfader) will feel oddly familiar to anyone who’s used the Traktor DJ app on iOS. You can pull in music from your Music folder, from any other places on your system, from iTunes, and – impressively – from Serato DJ, too (and it all works very fast). Denon DJ tells us that an “elegant solution is coming soon” for importing Rekordbox libraries, so watch this space for that. But once done though, the news is all good: The elastic beatgridding is the very best we’ve seen, anywhere – you can grid beat-by-beat, and beat shifts in difficult tracks are handled smoothly graphically. Results sound great, in no small part due to the pitchshifting algorithm that Denon DJ has licensed (Elastique, from zplane), that is amazing: see our demo of that in the main SC5000 video. One thing we noticed, though, is that once you’ve beatgridded a track, the track appears to “play to the beatgrid” at all times, even when sync is off (ie it is held to the selected tempo); thus you need to remember to have keylock when you’re playing a varying BPM track that has been beatgridded, or it’ll sound weird as the key moves around due to the SC5000 keeping the tempo fixed. We’d like the track to play to its beatgrid only when you ask it to (maybe when sync is pressed on that deck? ), or at least for the SC5000 to always hold the key correct when a track is “playing to beatgrid”. Neither solution is perfect though: a bit more thought needed by the developers here to get this right. Setting cues and loops is easy, clear and fast, and you can name both and give them colours, which transfer to the player, too. That said, we noticed some anomalies with looping too. Working with dual layers lets you audition possible mixes before adding your cues and loops and exporting. Unlike Rekordbox, there’s no mini waveform in the library view for quick click-and-preview of any part of a track without loading, and no other way of previewing tracks, which we missed, and there’s also no “last played” column, again, a good thing for DJs to have we’d say. More seriously, there’s no tagging or smart playlisting. Being able to tag all your “vocal”, or “sax” tracks, is a great thing in Rekordbox, similarly being able to have dynamic playlists that populate with “1990-1999” and “house” (for instance), just as is possible in Serato and iTunes, is an obvious feature request for the next version. It means playlists have to be constructed manually, and weakens the case for this right now as “music management” software. Also, as there is no operating manual at the time of writing for the software, and the tooltips are not very good (they seem to have only added what they’ve got around to at this point), it took a while to uncover various features. For instance, to set the size of manual loops, you need to pause the deck and hit the loop button, the scroll through the waveform . To zoom in and out of the waveforms, you need to use the undocumented keyboard shortcuts (Apple CMD or PC ctrl =/-). To turn sync on you click the button, but to turn it off, you don’t just click it again, you have to hold down shift, which makes sense on a hardware player but is baffling on prep software! We are sure these little things will be ironed out soon enough. Adjusting the beatgrids is intuitive and the results are highly accurate; it’s the best elastic beatgridding performance we’ve ever seen. Exporting is smooth and works well, simply via drag and drop which is easier than the way it happens in Pioneer DJ’s Rekordbox. And all available devices show in the devices panel. This panel is also where you set your player preferences – the same ones we went through on the player itself above. Transfer was pretty quick and hassle free, with a progress bar at the bottom to let you know what’s happening. OK, I would like to admit that while we worked hard here on getting this review done as well as we could, as quickly as we could… we also spent a considerable amount of time simply enjoying this new gear. It really is like using a laptop and controller, but minus the laptop. OK, so this far we’ve been pretty matter-of-fact: We’ve explained what we’re looking at here, how to get your tunes ready, and how to get something playing. I want to open the “In use” section by conveying some of what we felt in the studio in the few minutes that followed getting to that point. In short: We felt amazed, unbelieving, vindicated, excited, and impressed! Amazed that they’d pulled it off, and it was as good as they said it would be, while managing to feel actually simpler than the current industry-leading kit – kit which it instantly surpasses. Unbelieving, because of the sheer quality here: The touchable, smooth waveforms, the slickness of the workflow, the audio quality, the screen, the user experience. We’ve long said: Why can’t hardware feel like software, like tablets, like phones? Why does standalone DJ hardware have to feel somewhat archaic, kinda clunky, compared to software and controllers? Well, no more! Excited: For the future, not only of our own DJing with such amazing kit, but for DJing in general now that the doors are open for all DJs to share these features, even those who would never go near a controller/laptop in the booth. And honestly, just plain impressed, because at the end of the day, this set-up – especially alongside the X1800 Prime mixer – is one desirable piece of kit. We defy any self-respecting gear head to look at this, especially after a few minutes of playing with it, and not think “want”! So the rest of this section should be read in the light of what we just said, because we’re necessarily going to have to get stuck into talking about features, likes, dislikes and so on in a more prosaic way. 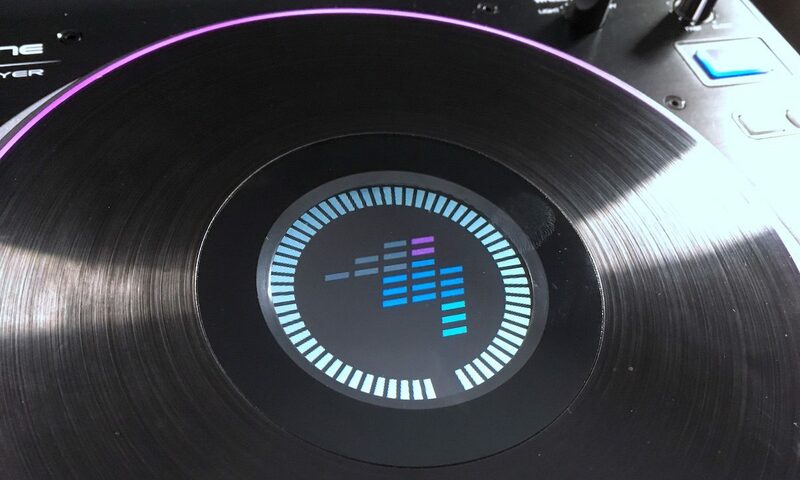 The platter has a small central screen that can show a logo of your choice (the Digital DJ Tips one looks kind nice, don’t you think?) or the track artwork. The platter is capacitive, not mechanical, so again – it’s like every controller bar about two that ever existed, and is silky smooth and quiet to turn – unlike the type used since (nearly) the beginning by Pioneer. To my fingers, I prefer the material and indentations used by Pioneer on its platter edges to the Denon DJ unit, but it’s much of a muchness in truth. The top surface feel uncannily like vinyl, having fine grooves – something which Steve Canueto, our scratch tutor, loved. It’s worth mentioning that – while it appears not to be a big issue (ours work fine, and we’ve only heard this issue from a single source so far) – there does seem to be a situation where these platters can suffer from “phantom hand” syndrome, where you hover your hand or fingers close to the platter, and it acts like you’re actually touching it. It’s affected such platters at times for years (I had to once earth my controller into a drain to stop it happening at a gig! ), but Denon DJ tell us that these platters “learn” how you use them and the environment they’re in, and such erratic behaviour smooths itself out almost instantly as soon as you start to use them. Just passing that on, as we couldn’t replicate it. 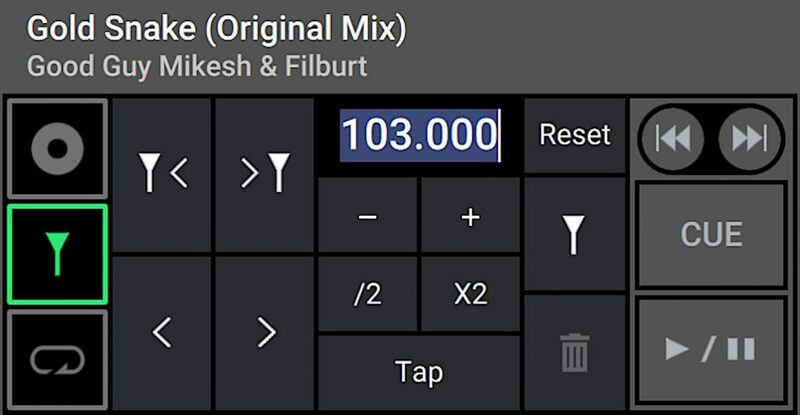 Currently, instant doubles (loading the identical track, running in the same place) isn’t possible; maybe it could be implemented as on Pioneer DJ gear, with a long hold of the Sync button? The performance pads are laid out in a single row of eight as opposed to the (more usual, for controller DJs at least) two rows of four pads across the bottom of the unit. Actually they make more sense this way, especially because when they are used as cue pads or for loops, the cues/loops can line up chronologically in your track, and each can be named, with those names appearing on the screen too. That is that in Loop mode, Slip doesn’t work; it flashes promisingly if somewhat erratically, but doesn’t engage at all. 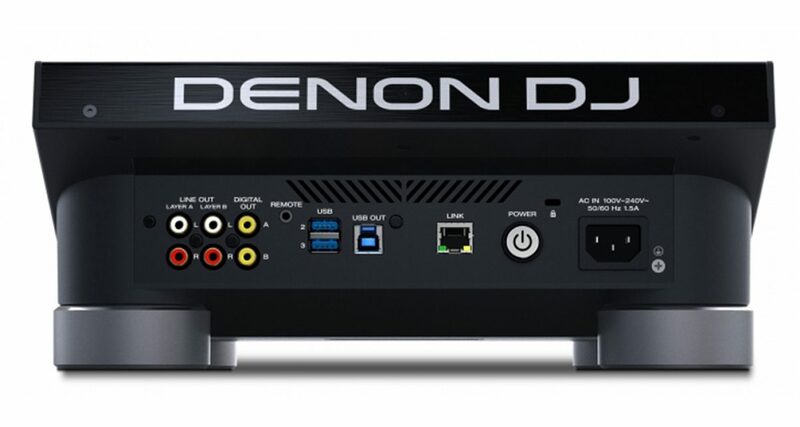 Denon DJ’s team says this is a “design choice”, but we hope to see this “choice” quietly reversed soon. After all, why have a Slip button if it doesn’t let people choose whether to engage it or not, instead just flashing weirdly advertising its non-availability? Finally here, like with Rekordbox DJ, any cue and loop changes you make (as well as beatgrid adjustments – although the only thing you can change is the position of the “one” beat,) get saved back to the USB and thus your copy of Engine Prime on your computer when you next insert the USB there and load the software. Denon DJ owes a considerable debt to Pioneer DJ, for the way this unit is laid out. Denon was right there at the start of DJ CD players, but it was Pioneer DJ that established the standards, which the SC5000 Prime faithfully imitates. However, it is also true to say that it improves markedly on nearly all of them. The player walks a careful line between traditional and innovative; it is familiar enough to make the learning curve shallow for DJs coming to it from other media players, but the overall experience is exciting enough to appeal to DJs (like us lot) who have been smitten with controllers and software for years. 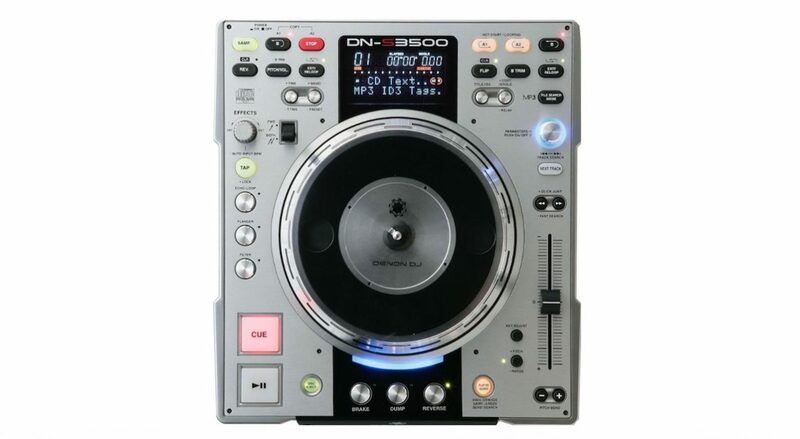 One small addition/change is the inclusion of Denon DJ’s beloved Pitch Bend buttons, which appear here in the usual place right under the pitch control, doubling up as Pitch Range with the Shift key held down, thus doing away with the need for a separate Pitch Range cycle-through button as on Pioneer DJ gear. Also, there’s the previously mentioned Layer button for switching between the two decks. Other things also appear in the same places, even if they are laid out much differently on the Denon unit than the Pioneer models (for “laid out”, read “simplified”): I’m talking specifically about the “source” controls, and the big scroll/load encode and its associated forward/back buttons. We spotted a weird issue with the cue points not playing back properly when off the beat with a larger Quantise setting (as Cue 3 is in this photo). When you set a hot cue away from a beat (ie between two beats), then set the Quantise to a larger value (ie one beat), triggering that hot cue plays it twice momentarily, erroneously, disrupting the beat flow. We’ve alerted Denon DJ to these things and they’re hyper responsive, so let’s see what comes back. Feel free to let us know of anything else you spot in the comments. So we already talked about the three USBs and the SD slot, with one of each on the front. Around the back, there are the two analogue out stereo pairs plus two digital outs, a USB out, a Link for connecting the players together / to an X1800 mixer, plus the power input. The back of the unit, clearly showing the two sets of RCA outs for DJing with two decks, or “layers”, on a single unit. Here you’ll also find the power button (it’s a standby/on type button, not a true “off” – to turn the unit fully off, you pull out the plug – even if you do that, the power carries on for a few seconds), a Kensington lock hole, and a small cooling vent. This is really the centrepiece of the controller. 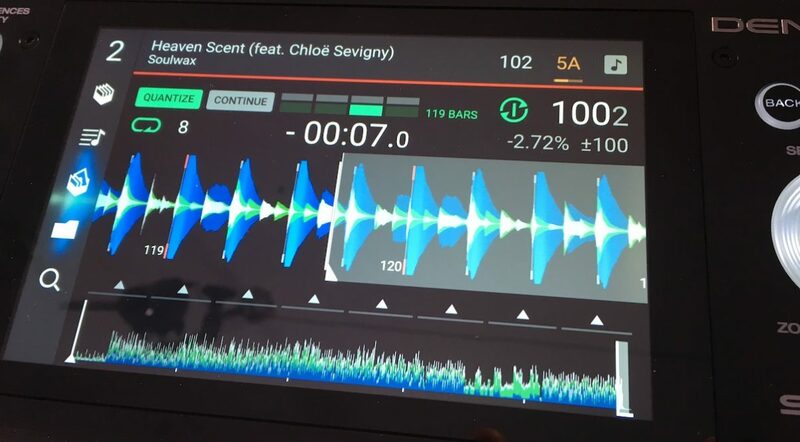 An iPad-esque hard glass screen with high resolution, full colour display, it redefines what we will from now on expect from DJ gear screens. In Performance View, you can pinch and swipe apart the waveform for zoom, tap things (eg the time passed/elapsed control, Quantise); basically, it is as intuitive, fast and fun to use as the phone in your pocket. And unlike other previous attempts at incorporating touchscreens into DJ controllers, this performance section has just the functions you need, the rest wisely remaining on the physical controls (I’m thinking mainly of the pad controls here). Really, though, you’re going to use this view for watching what’s happening with your waveforms, to keep an eye on cues, loops, Slip mode, time elapsed, what’s coming up, and so on. The screen splits its life between this view (smooth waveforms and performance feedback) and the library views. In Browse view (touch the View button), you can view your music and load tracks. The biggest thing you should take away here is that it feels like you’re still using Engine Prime on the laptop, with all the best bits of touchscreen technology; the colours, the layout, the speed, the naming conventions… everything feels like simply an extension of your prep, being done on your phone. To put it another way, you really don’t miss the laptop. I mean it – we’ve finally got there, hallelujah! So your Crates are here from your earlier prep (think of Crates as “big collections”). Your playlists, too (more ad hoc, tracks in them can be arranged in an order on the laptop before being imported here.) You have your History here as well (great for inspiration from previous sets). There’s a useful “Prepare” window illustrated with a cute little “record half out of the box” icon, and you also have a standard Files view. Finally, Search brings up a Qwerty keyboard, and is slick; you can quickly search by artist, track, album, key and tempo. You can then sort the resulting tracks by the same categories – but let’s have tags though, please, Denon? Of course, you can select tracks by turning the encoder, but you can also (and you will, believe me) just swipe – it’s totally intuitive. Swipe left to add to the Preparation window, right to load. Tap and hold brings up track info. In crates you can filter tracks by genre, title, artist, key or BPM, by tapping those icons respectively, tapping twice to reverse sort. Of course, all this means little if it somehow just doesn’t feel right. Well, no need to worry there. Maybe I should put it this way: we set them up here at the Digital DJ Tips studio for an “initial play”, yesterday, and that was it for the day – they took over everything! We were back here at 7am this morning, and we’ve been on them ever since – plus we’ve had various team members “popping in” to the office for convoluted reasons, not at all connected to playing on these, no sir-ee. Meanwhile, those who aren’t close by have been whinging royally on our company IM about wanting to be here (“So… when can you fly me out to HQ,” our Assistant Editor Joey Santos asked). It’s fair to say they’ve got everyone’s imagination. The bottom line is this: They feel fun. You have confidence in the abilities of the players, so they feel dependable. More than that, they feel familiar and intuitive, and this will be especially true for DJs coming from controllers. Meanwhile, the touchscreen behaviour makes you feel at home swiping and scrolling – that combination of traditional layout and feel plus touchscreen immediacy and software features is pure killer. 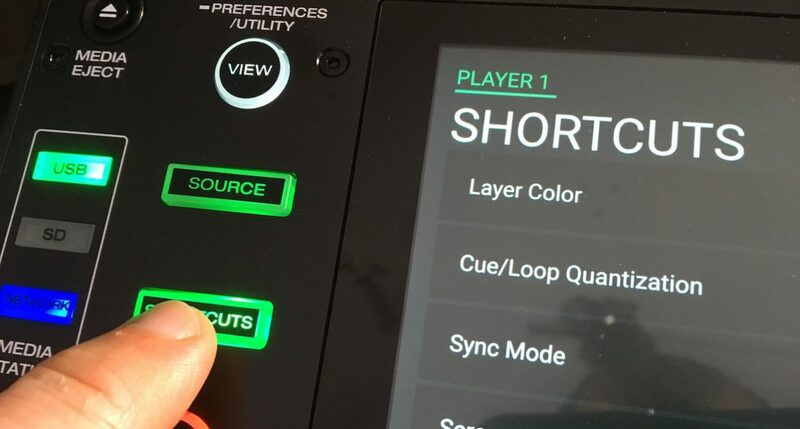 One of the things we think Denon DJ has done particularly well with this release is to backwards engineer features for DJs used to working how shall we say it, in a slightly “archaic” way. You know: Throws some tracks on a drive, turn up, play – no analysis, no beatgridding, no cue pointing, no saved loops, no keymixing – basically old-school vinyl DJing, but with USBs. The “pad lock” mode turns off the pads, so DJs who don’t want to use them don’t get in a jam. Denon was right there at the start of the CD DJ revolution (this is an early player, the S3500), but it’s fair to say Pioneer stole the show hook, line and sinker. 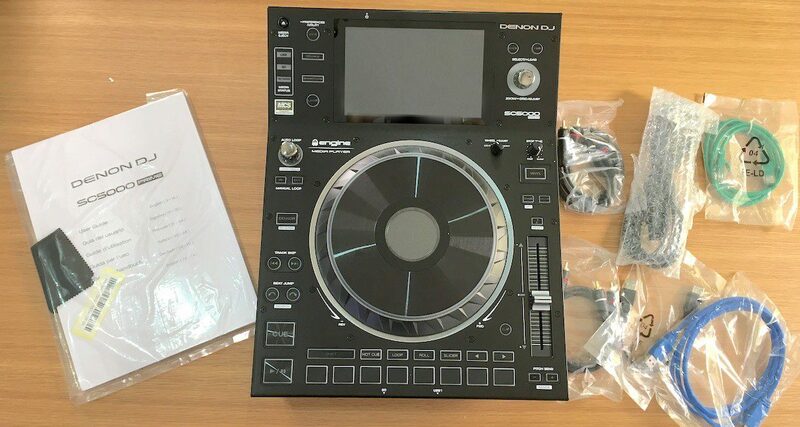 Is Denon DJ about to make a major comeback? It certainly has a great chance. This is the singularly most impressive piece of DJ technology we’ve ever reviewed, and ushers in a new era for DJing. It feels like the best of everything else, all brought together; a new mature standard, and it pulls that feat off because Denon DJ has got just about everything right. Sure there are for us a few missing features (tags, smart playlists), and we’d like to see the weird stuff fixed (Slip mode, the multi-player cue bug), but this system is already close to perfect. Indeed, it is the first full separates set-up I’ve ever used that feels like the best of software – and from the founder of a company started to champion the ways software has, over the last few years, been dragging DJing kicking and screaming into a new age, that is praise indeed. Not only will controller DJs love these, but stick-in-the-mud club DJs are about to realise what they’ve been missing, hence my “new age” statement: Laidback Luke told me that part of his amazement with this stuff was that he just hadn’t realised that this technology was out there, having never DJed with software. We’re so glad these functions finally have a chance to win over the DJs at the top, just as we’re glad gear aimed at them finally feels good to us. Denon was once a huge brand in pro DJ booths, but now for the first time in years, the future looks promising too. Upon announcement, many had doubts that the brand would gain traction with this stuff, no matter how good it turned out to be. But the company has, indeed, gained traction: Big DJs are on board, and more importantly, the products live up to the hype. 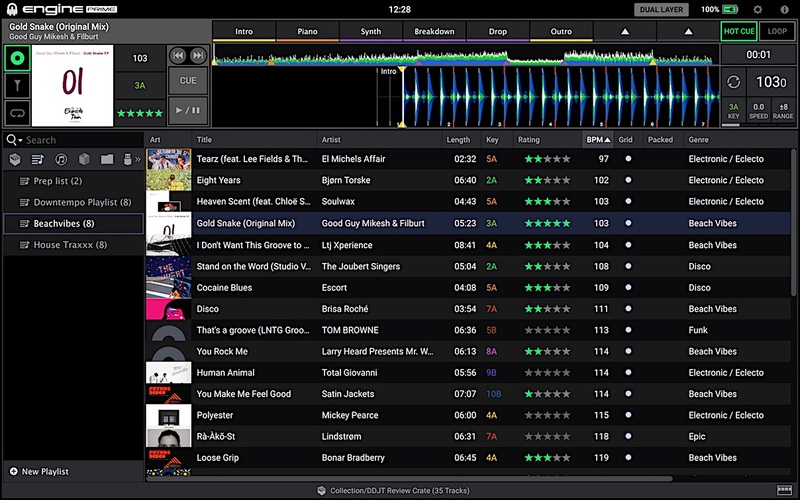 With Serato DJ integration already promised, Rekordbox importing also on the cards, and that awkwardly tight-lipped response to our direct “Is Traktor coming, then?” question, it does appear that whatever your flavour of system, you’ll be able to use these units with it soon enough – something important when a product is trying to become a new standard, of course. So what about the price? Well, with the SC5000 Prime (and the X1800 mixer) both priced at US$1899 / £1449 a piece, that makes two units and a mixer US$5,697/£4347. This is of course pro territory, but the equivalent three Pioneer DJ units would cost US$6591/£5877, so you’d be saving US$894/£1530 at current street prices by buying Denon DJ. Things get more interesting, though, when you look for four-deck compatibility. In that case, you’d need four Pioneer units, meaning you’d be paying nearly double. In the elevated world of pro DJ gear prices, then, Denon DJ currently offers easily the best value, as you get that without buying four players. 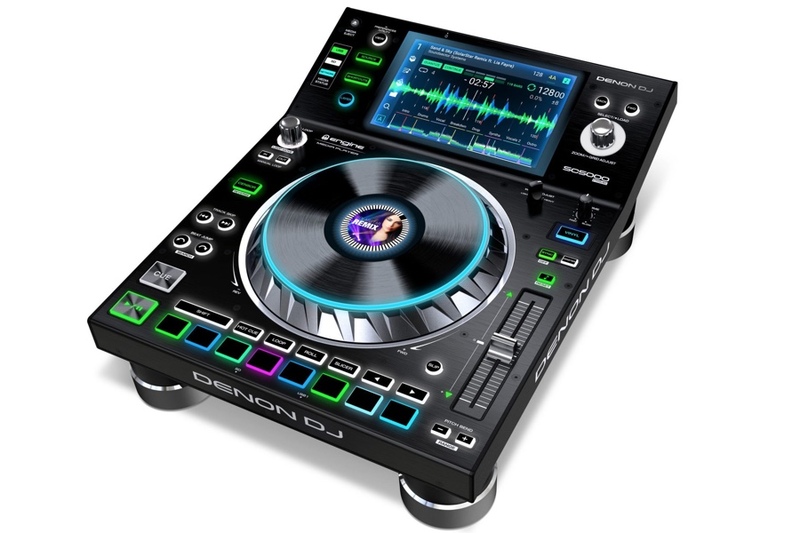 Should I buy Denon DJ? If you’re a beginner, unless money is no object, no. Buy a decent DJ controller and use the laptop you already own. You’ll get all this functionality for a few hundred, tops. If you’re a “prosumer” who knows your stuff and wants the best, sure, but for you, a really high-end controller will do the same, and still for far less. Mobile DJs will probably prefer to, also, go for a decent high-end controller, for ease of transport and setting up. 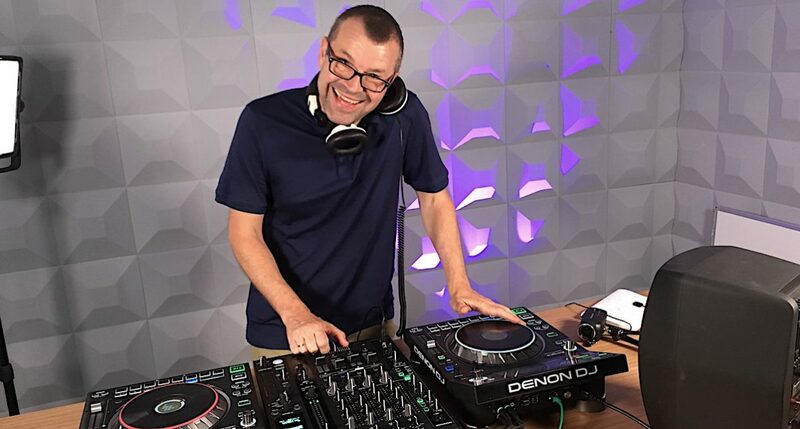 If you’re a club owner, promoter or venue manager, you may just hear a growing number of DJs requesting Denon DJ gear from now on rather than a traditional set-up, so you’ve got a harder choice. You may end up needing to own a set of both. 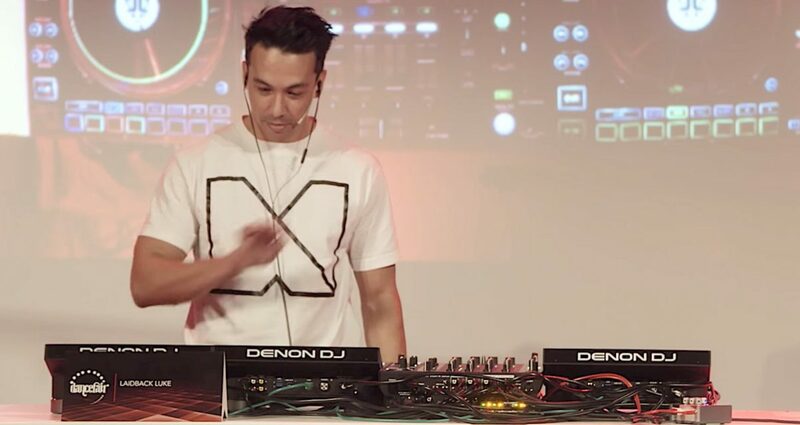 Laidback Luke professed to me that he was amazed at what he’d been missing out on in the software / controller world, things that the Denon DJ gear brings to the pro booth. He’s one of the big-name DJs who’s already put his name firmly behind the unit, along with Tïesto, Paul Oakenfold and others. 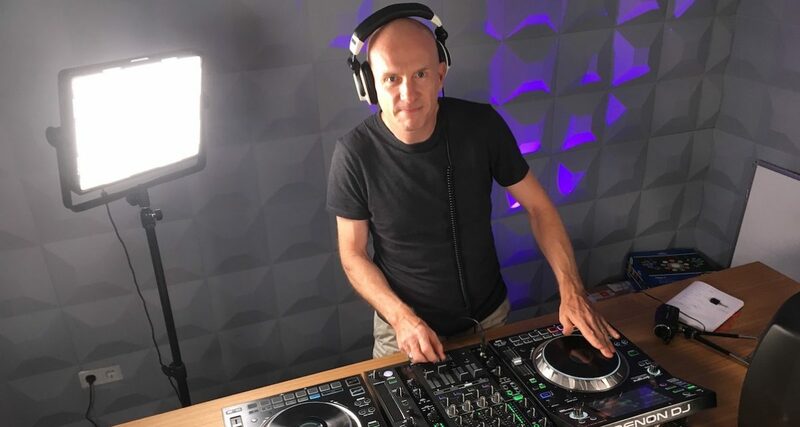 And if you are one of those club DJ, guest DJs, residents or touring DJs, or simply somebody who prefers separates to controllers, frankly, we say do it! Pioneer’s stuff now looks very out of date, shockingly so in fact. Let’s be clear: Pioneer DJ has done many, many things right for many, many years, and still makes some fantastic kit. But nobody can be ahead all the time, And you could wait a while for Pioneer’s reply to all of this (although you can rest assured their engineers are working hard right now on a reply – we’d guess an “XDJ2000”) because Denon has really achieved something special with Prime. The really interesting thing is that if a tipping point is reached before Pioneer DJ gets out its next players, a lasting power shift might actually happen. Whether it does or not time will tell, but for now, Denon DJ’s Prime series is not only hands-down the best laptop-free DJing experience on the planet, it’s probably the best DJing experience on the planet, too. First of all, compliments on the website and this review. Almost everything is covered in this review, though missing one crucial thing that we dj’s are in for and working with: How does it stacks up regarding audio quality? In most dj equipment reviews nobody talks about the audio quality and a simple ‘studio’ quality or specs does not describe the audio nuances I seek in pro/high end audio equipment. Even top quality audio equipment (Classé or B&W diamond) has audio differences and tastes……. Thank you. I await your opinion in great anticipation.